Round three of the AMA Supercross series was bittersweet for Team Honda HRC, as Cole Seely turn in a solid performance to notch his first podium finish of the season, while teammate and erstwhile championship leader Ken Roczen was injured in a hard crash. Seely launching his CRF450R to a third-place start and then quickly made the pass into second place. He maintained that position until just after the halfway point, when a mistake caused him to stall his bike, resulting in the loss of one spot. 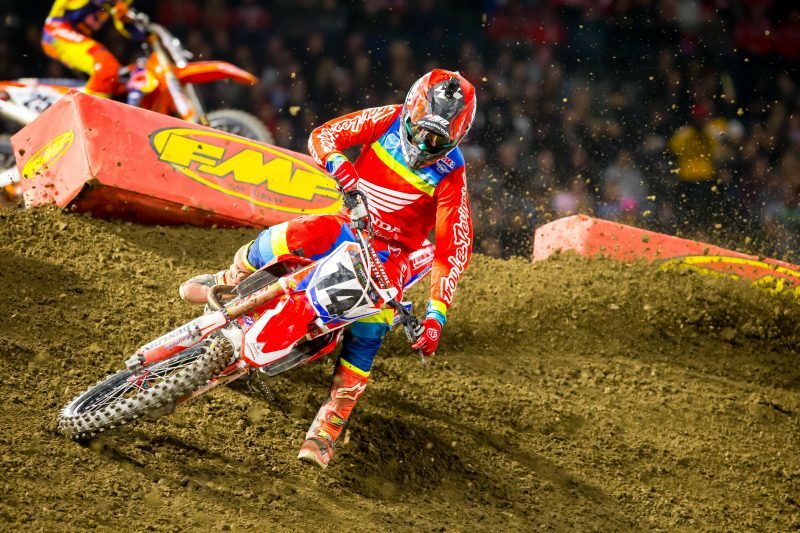 Seely ultimately took the checkered flag in third, earning the 10th podium finish of his 450 career. After a less-than-desirable start in the main event, Roczen had quickly navigated through the pack and was sitting third behind Seely on lap 9, when he lost control through a rhythm section, separated from his bike in the air and went down hard, leaving him with a compound fracture of his left radius and a dislocated elbow and wrist. Roczen was transported to a local hospital for evaluation before flying to Colorado on Sunday morning to have his personal physician perform surgery. Additional information will be released when it becomes available. 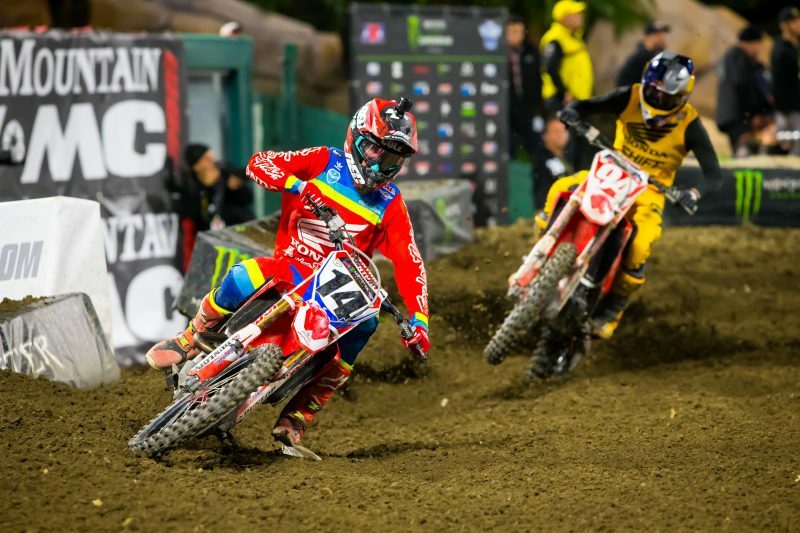 On Thursday, Ken Roczen and Cole Seely spent time at American Honda’s headquarters in Torrance, California, for a full day of activities. In the morning, the two factory riders were in the motorcycle-division’s offices for a Q&A and autograph session with associates. After that, Roczen and Seely headed down to the race shop for a fun video shoot that will be highlighted in Episode 2 of Honda’s REDefined web series, dropping early next month. 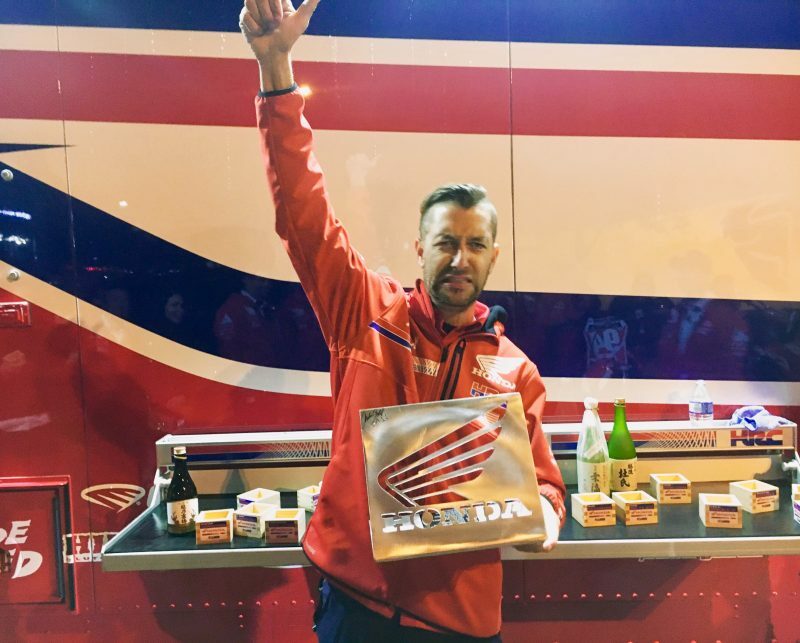 On race day, Team Honda HRC was pleased to host a special guest, Foo Fighters bassist Nate Mendel. Mendel and his friends spent time in the pits with the team, touring the semi, meeting the riders and interviewing with Fox Sports 1 reporter Jenny Taft. With inclement weather causing the cancelation of free practice for the third consecutive week, riders were forced to learn the track while trying to lay down fast qualifying times for the evening program. 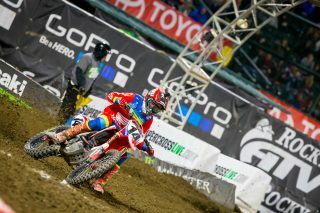 Roczen ultimately qualified fourth-fastest with a 55.846-second time, while Seely was eighth with a time of 56.418. 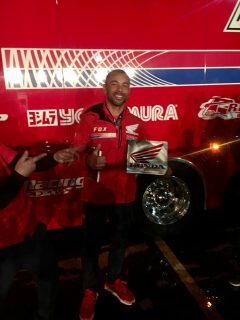 At Anaheim 2, Team Honda HRC was pleased to host Mr. Naoki Hattori from the HRC Business Support Division, who was attending on an official trip. As has been the case at every round so far this season, both Team Honda HRC riders were seeded in the same heat race. 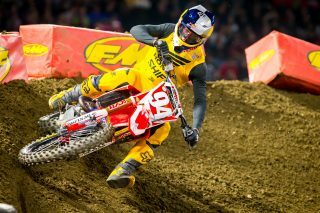 When the gate dropped, Roczen emerged as the early leader and rode unchallenged to his third heat-race win of the season. 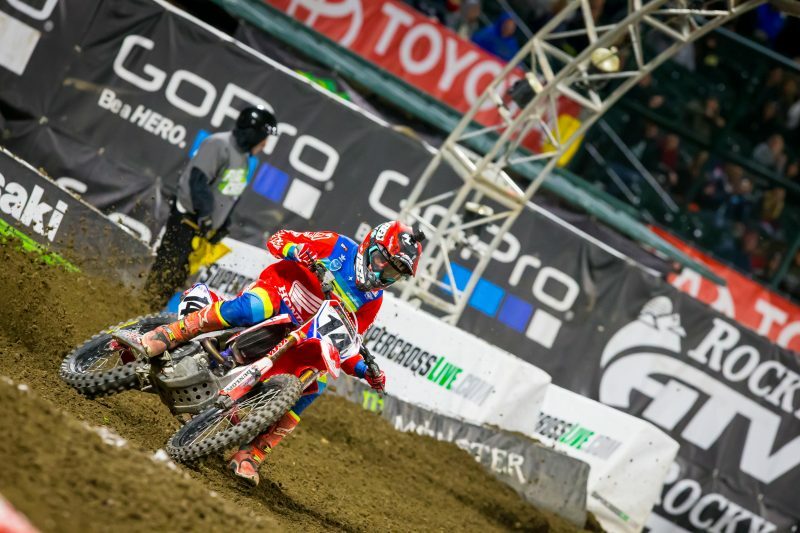 Seely came off he line in sixth and spent the entire seven-lap race battling for a transfer spot, swapping positions back and forth before finishing fourth and advancing to the main. 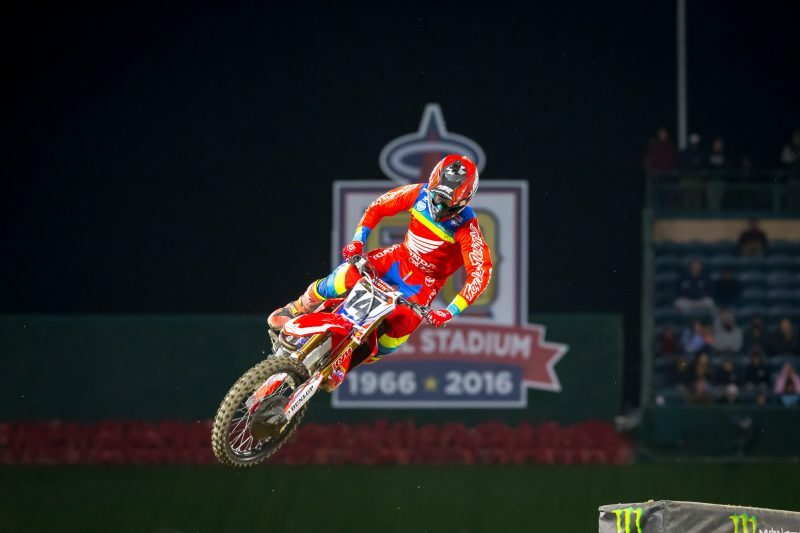 This Saturday, Team Honda HRC will campaign round 4 of the AMA Supercross series, in Glendale, Arizona. 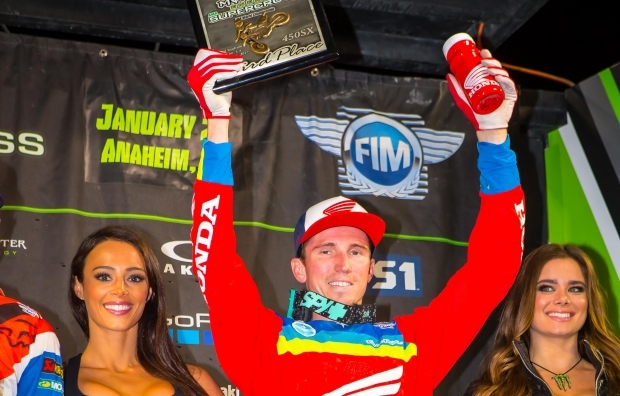 The evening before the race, a rider appearance is scheduled at RideNow Powersports in Peoria. 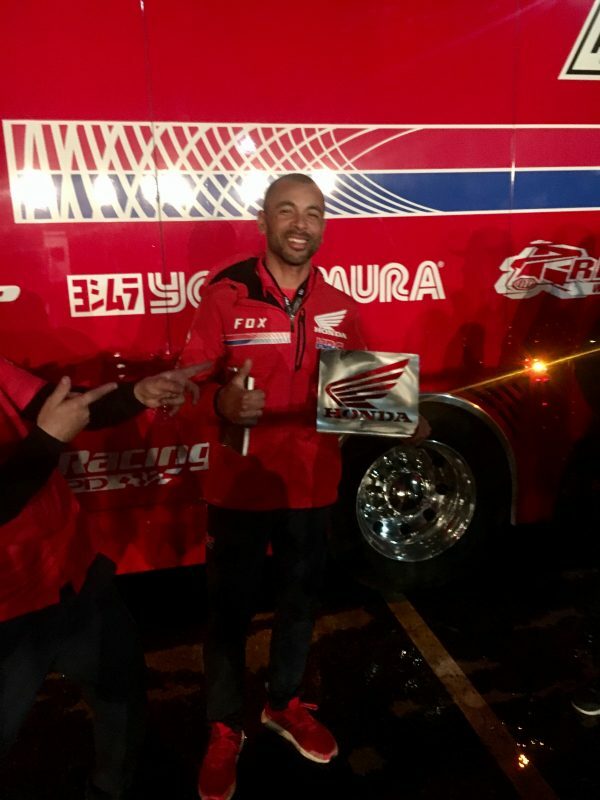 At the beginning of the season, American Honda’s Brand Ambassador Andrew Short had the idea to implement a weekly Team Honda HRC award to recognize a team member for putting in a particularly impressive effort. The person who earns the award signs it and keeps it until the next round. Short himself was the winner of the award at the opening round, in recognition of his help doing interviews, signing autographs and filming and mentoring the riders. Engine technician Lars Lindsrom got the nod at round two after sacrificing family time to drive to Arizona to help the riders train and to work on their bikes. Support mechanic Jason Thomas won the award this week for his work building and prepping bikes throughout the week, for Short and the REDefined video shoot. The plan is for the riders add their signatures to the award at season’s end and to auction it off, with proceeds going to the Road 2 Recovery Foundation. It’s always good to walk away with a podium finish. Unfortunately, I had a little hiccup there in the middle that definitely cost me second but I was still able to come away with third. I really wanted to push toward the front and set my sights on [Ryan] Dungey instead of settling for a third place but I’m still happy with it. We made some good improvements this week, so thanks to my team for being behind me. Overall it was a really good weekend for Cole. He had good starts in both his heat race and the main event, which is an improvement over the past couple weeks. 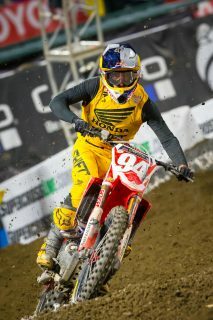 I think he was riding really well and even catching [Ryan] Dungey a little bit before he stalled his bike, unfortunately. He said that he just got on the rear brake too hard. Luckily, he only lost one position from that and we were able to come away with a podium. It’s good progress so we’re excited to keep moving forward.